It's not everyday you get to meet one of you food heros. 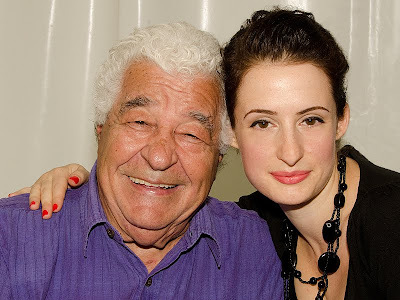 Antonio Carluccio represents a lot of how I feel about Italian food in attitude and passion. I guess that's why they call him the Godfather of Italian food. After meeting him, I now also know him as the charmer of Italian food! The warmth that radiates from your television screen when he is on the box, is evident in his character. Such a gracious, approachable and friendly man, I was lucky to have the opportunity of a quiet 10 minute chat with him before his slot on the Brighton Food Festival Live Food Show where he cheerfully taught us about mushroom varieties (part of a nationwide Carluccio Mushroom Festival) and how to cook the perfect mushroom risotto, throwing in the story of his love of foraging from childhood and a few obligatory Berlusconi jokes into the mix. It was an absolute piacere. I loved Two Greedy Italians, which showed the passionate relationship between Italian people and their food. Do you think the UK will ever have the same relationship? It takes time. You can't jump generations. Italians have always eaten food together, with the mother still taking care of the food and the family. Children pick up their attitude of food from their family and their education of the palette is developed at a very young age. Good food is necessary for health and also your mentality. It's an attitude. What is the future of Italian food? Recent reports state that child obesity in Italy is on the increase and attitudes are changing. This is a trend from all over the world I'm afraid. Even in Italy, people are shopping in the supermarket, for the easy and the ready made, although the quality of food in the supermarkets there is still generally better. But computers and lack of exercise also (is contributing to obesity). I've never lived in Italy but being raised in an Italian family environment, my head my be English but my heart (and definitely my stomach!) are certainly Italian. You left Italy when you were just 21, where do you call home? Spiritually Italy, but really the whole world. I love people and to communicate in different languages. I speak 5 different languages. What do you think of the popularity of restaurants such as Polpo and Polpetto, based on Venetian bacari, do you think they are helping to spread the knowledge of regional Italian food? (Shrugs) It's an attempt to copy tapas. Antipasto is liked and so varied in Italy so why not? You get to taste everything without getting full on pasta, ravioli. My family are from Abruzzo, are there any foods from that region you particularly enjoy? I'm making pasta and fagioli for dinner tonight. Any tips? Go to a deli and get a piece of fat. Not the yellow fat, but the white, from the prosciutto to give it flavour. Soaking dried beans is better but takes a long time and it's important that they must be very well cooked, otherwise you get hard bits. Tinned beans are fine to use, like borlotti or cannellini. Squash half of them to thicken the broth. To finish, sprinkle over a little peperoncino and olive oil, or a little chilli oil. Carluccio then went on to cook his classic mushroom risotto for us and show us how to prepare them and a few different varieties, some of which I have never seen before like the Hedgehog or Blewitt as well as tips for foraging (twist mushrooms rather than pull them, preserving the mushroom roots (mycelium) and to take someone who knows mushroom varieties otherwise it could be your last meal!). He used a LOT of butter to fry his onions in before adding the rice (carnaroli - "the Ferrari of rice") and briefly "toasting" it in the pan. 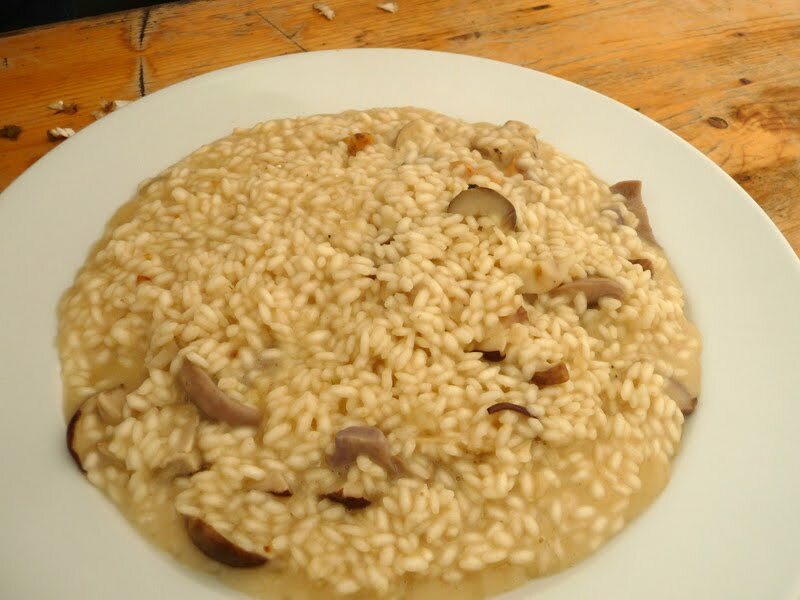 The different mushroom varieties were cut directly on top of the rice and allowed to sautée a little before a ladle of chicken stock (strengthened with a cube of Star Porcini stock cube) was added, left to absorbed before another was added. Salt, yet another generous knob of butter and a handful of Parmesan was all that was added at the end. And that was it, reminding us that the reason Italian food is so loved, is that with minimal effort, you can create something really nice. Far creamier (and wetter) than my version, with a lot more butter (but better for it), I learned that a good risotto should never pile up, the consistency should be all'onda (like a wave). I was also very happy to hear that there will be more Two Greedy Italians coming our way soon. Carluccio is currently on a tour celebrating his beloved mushrooms. From the 10th September until the 10th October, Carluccio restaurants will be showcasing mushroom dishes using different varieties of mushroom, the shops will sell a selection of mushroom and truffle goods and mushroom markets will be taking place around the country. He is also launching a nationwide mushroom competition which will be judged by the man himself and offered on Carluccio's special board. Winners will also have the chance to cook with Antonio in his London kitchen.